Orzo pilaf is one of the dishes I remember from my university years, I saw it for the first time there and we would have it at least once a week at the school cafeteria. I do love Orzo Soup or love rice with orzo, but had had no idea about orzo pilaf until I started university in a different city. It was mostly served with chicken and meat dishes and was a nice complement, but I would always think that there was something missing in that pilaf. It was a plain orzo pilaf, there was nothing fancy in it and I knew I could make it more appealing with a good twist. Combining orzo with rice is not something new in Turkish cuisine, we love to have them together in a typical Turkish rice pilaf, which is rich in the amount of rice and has little orzo. I made the opposite this time using a lot of orzo and little rice in this pilaf. What is unusual in our cuisine, yet a bonus in this pilaf is the avocado cubes. Avocado is not well-known here, but I try to develop recipes with it since I know how healthy it is. I don’t know if avocado has ever been used in a pilaf or combined with orzo in other cuisines, but I thought the butter like flavor of avocado would pair very well with orzo and rice. I wasn’t wrong! It turned out to be such a tasty orzo pilaf that you might have it either warm to pair with stews or cold as salad. You will love it both way! I love to give a little sourishness to avocado, so you should squeeze lemon on the orzo pilaf when eating and you will love it even more! 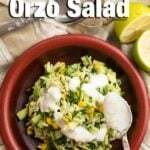 This orzo pilaf with avocado make a great picnic food too! Just put it in cups and enjoy it cold in your favorite park. You can also take the leftover to work or school in your lunch box. Don’t forget to take a cup of homemade yogurt to pair with it! They go amazingly great together! 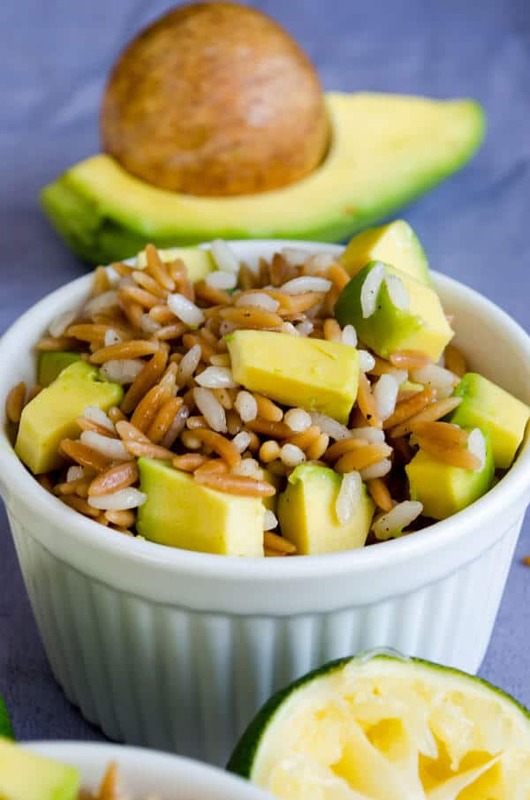 Orzo and rice are very well combined with avocado cubes and make a perfect side! Heat a large skillet and add olive oil in it. Saute orzo and rice in it until orzo gets nicely brown over medium low heat. Pour water, sprinkle salt and black pepper and cover. Cook it over the lowest heat until tender and all water is absorbed. Toss in avocado cubes and mix.